PPSS Anti Spit Masks | Effectively helping protect prison, police, security and health care professionals from potentially long last lasting infectious diseases and emotional distress. PPSS Anti-Spit Masks have effectively helped protect prison, police, law enforcement and security professionals as well as paramedics and other frontline staff from Hepatitis B and C and other infectious diseases such AIDS. Unions representing the interest of the above professionals in countries around the world have for some time raised serious concerns about the increasing number of spitting incidents, as it has well known serious potential health risks. It is not just the officer that is affected but also their family, as tests and treatment for suspected contagious diseases can last for several months and lead to severe stress and anxiety. During a recent court case (February 2015) against a 27 year old man who spat into a police officer’s face the leading judge said: “The actual assault of spitting is taken extremely seriously by the courts. Spitting is particularly distressing for victims – it’s a very nasty form of assault.” I couldn’t agree more. Police in New Zealand have reported difficulties in restraining drunk and drugged people and preventing them from hurting themselves, according to NZ police magazine Ten-One. A two-year safety review of 8000 cases found nearly 10 per cent of offenders had spat at officers, who had limited tools to deal with it. The ‘Reporting Services’ of the London Metropolitan Police published that ‘The Count Of Noticeable Offences where the classification method featured either the keyword ‘spit’, ‘spitting’ or ‘spat’ and there is a recorded victim with an occupation of ‘Police Service’, there have been 2,416 incidents between 1st January 2010 and 31st October 2013. 2,416 frontline professionals of which we don’t know how many ended up with a serious infections disease, but who undoubtedly will have been waiting anxiously for the results of their blood following the 14 days of the assault. Over the past two years I have given ‘off the record’ access to risk assessments conducted by police forces and ambulance/paramedics in several countries around the world. There is no question in my mind that everyone charged with ensuring the safety of frontline staff is slowly coming to the conclusion that a ‘spitting assault’ in one’s face is disgusting and can have fatal consequences. In the U.S. anti spit masks have been in use for a pretty long time now. Judges have ordered prison officers and court officials to cover the heads of certain prisoner when attending court due their history of committing such assaults… and yes… we can call this an ‘assault’. Thousands of anti spit masks are now being carried by thousands of law enforcement, prison and ambulance professionals, ready to be ‘deployed’ and used as soon as a hostile or intoxicated member of the public represents a realistic threat. 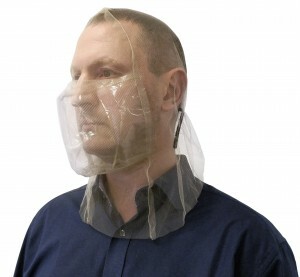 I am extremely confident that PPSS Anti-Spit Masks can make the difference between staying safe or suffering from a potentially long lasting and severe illness. When confronted by a hostile or intoxicated member of the public, a combatant, prisoner, disturbed hospital patient or service user, the risk of being spat on is realistic and protection from such threat is in my opinion very sensible. … a ‘member of the public’ spitting at me. … non of his bodily fluid is making contact with me but is rather kept contained within the anti-spit mask and then channeled vertically down. PPSS Anti-Spit Masks are compact, easy to deploy, safe, disposable and individually packed devices, already used by agencies and organisations around the world. This type of device is to be slipped over the head of a combatant, prisoner or seriously intoxicated or aggressive member of the public following his arrest. I am of course fully aware that the use of anti-spit masks has been questioned by some people (e.g. human right campaigners) in the past, raising concerns in terms of the risk of suffocation, especially when such anti-spit mask is forced over the head of someone suffering from breathing difficulties. Human rights activist also raised their voices claiming it could send wrong signals or even raising concerns of the ‘look’. Some human activists with rather strong opinions even compare the use of anti-spit masks with the treatment of prisoners at Guantanamo Bay, questioning if such device should be used on someone because he or she is just very drunk. Well, please allow me to make this one very clear here… my firm and my widely reported and genuine passion is not about the personal appearance of someone who is hostile, physically aggressive, completely out of control and clearly willing to harm someone who protect and serve the community. The mission statement of my firm PPSS Group is simple and clear: “Protecting Frontline Professionals From Human Threats”. “Human Threats” = firearms, edged weapons, hypodermic needles, human bites and in context of our latest product… someone spitting saliva or potentially infected blood right into your face! The future use of PPSS Anti-Spit Masks will be controversial, but no one can fault my firm for our genuine desire to want to reduce operational risks, workplace violence related injuries and in extreme cases even death. Well… I agree. For me personally it is absolutely key that whatever we at PPSS Group design, develop and manufacture it must be a) right and b) good… and I believe anti-spit masks are precisely that!